As the Titanic and her passengers sank slowly into the Atlantic Ocean after striking an iceberg late in the evening of April 14, 1912, a nearby ship looked on. Second Officer Herbert Stone, in charge of the midnight watch on the SS Californian sitting idly a few miles north, saw the distress rockets that the Titanic fired. He alerted the captain, Stanley Lord, who was sleeping in the chartroom below, but Lord did not come to the bridge. Eight rockets were fired during the dark hours of the midnight watch, and eight rockets were ignored. The next morning, the Titanic was at the bottom of the sea and more than 1,500 people were dead. When they learned of the extent of the tragedy, Lord and Stone did everything they could to hide their role in the disaster, but pursued by newspapermen, lawyers, and political leaders in America and England, their terrible secret was eventually revealed. The Midnight Watch is a fictional telling of what may have occurred that night on the SS Californian, and the resulting desperation of Officer Stone and Captain Lord in the aftermath of their inaction. Told not only from the perspective of the SS Californian crew, but also through the eyes of a family of third-class passengers who perished in the disaster, the narrative is drawn together by Steadman, a tenacious Boston journalist who does not rest until the truth is found. 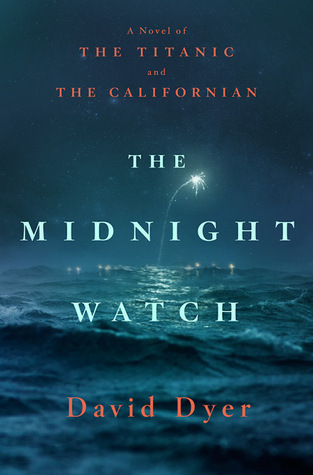 The Midnight Watch is a powerful and dramatic debut novel--the result of many years of research in Liverpool, London, New York, and Boston, and informed by the author's own experiences as a ship's officer and a lawyer. I pretty much read everything I see about the Titanic, so this one is definitely now on my list!